A contestable market occurs when there is freedom of entry and exit into the market. Due to freedom of entry and exit – existing firms always face the threat of new firms entering the market. This threat of entry is sufficient to keep prices close to a competitive equilibrium and profits low – otherwise, new firms enter. In a contestable market, it is not the number of firms that is important, but the ease by which new firms can enter the market. If the market became perfectly contestable – with freedom of entry and exit, then the existing firm would have an incentive to cut prices to P2 (point B) – Otherwise, new firms would enter the market until normal profits are made. Therefore, contestable markets will have lower profits than monopoly. Therefore policymakers should not just look at the degree of concentration, but also the degree of contestability and how easy it is to enter the market. Regulators in the privatised industries have often focused on removing barriers to entry, rather than breaking up big firms. Sunk Costs If sunk costs are high this makes it difficult for new firms to enter and leave the market. Therefore it will be less contestable. For example, if a new firm had to purchase raw materials, that it wouldn’t be able to resell on leaving the market, this may act as a deterrent. Access to technology and skilled labour For some industries like car production it is difficult for new firms to have the right technology. Nuclear power may require skilled labour that is difficult to get. This makes the market less contestable. If you wished to compete with Google, you may find it hard to employ the best software engineers because Google pays its employees a very good wage and is seen as an attractive company to work for. As well as looking at barriers to entry, there are other factors that might indicate the competitiveness of a market. The level of profit. If the market is highly profitable, this suggests the market is less contestable. In theory, if firms are making supernormal profit, it would attract new firms into the market. 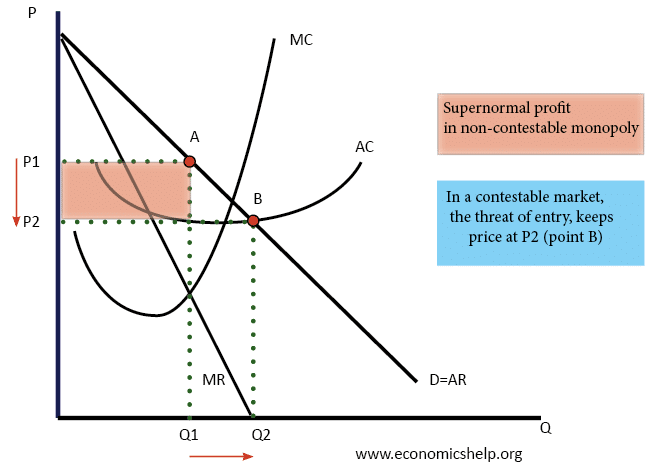 The persistence of supernormal profits suggests that hit and run competition is not possible and there are barriers to entry. The number of firms. A contestable market could have a low number of firms – as long as there is the threat and possibility of new firms entering. However, if there are only a few firms and it has been many years since any new firms have entered, then it is likely to be less contestable. If there are recent examples of firms entering the market, then it is likely to be more contestable. It is important to remember that contestability is not a clear-cut issue, there are degrees of contestability, some markets having more capacity for new firms to enter. In practice, few industries are perfectly contestable. There are high sunk costs in getting a network of banks set up around the country.. Brand loyalty to existing banks is high. Customers are not so willing to switch. Therefore a new firm may have to spend a lot on advertising to attract new customers, which is a sunk cost, therefore not contestable. Existing banks make very high profits, suggesting hit and run competition does not occur. These issues suggest banking is not contestable. However, other factors may suggest greater contestability. The introduction of the internet has reduced set up costs and enabled new firms to enter the market for online banking e.g. EGG, Virgin business. The government is trying to introduce regulation to reduce the time and costs of switching to another current account. Remove legal barriers to entry. Royal Mail used to be a legal monopoly but now firms are allowed to enter the market for sending letters and parcels. Legislation against Predatory Pricing If a firm can engage in predatory pricing it can force new firms out of business and make it less contestable. OFT can legislate against abuse of Monopoly power. If a firm abuses its monopoly power by restricting supply to certain firms the OFT can intervene to overcome this restriction on contestability. A government firm. In the banking industry, the government has even toyed with creating its own company to help increase competition and increase bank lending to small firms. This could be a last resort where private firms face insurmountable barriers to entry. Note, there are many barriers to entry that the government can’t solve. The government can’t alter the economies of scale in an industry. Is transport a contestable industry?